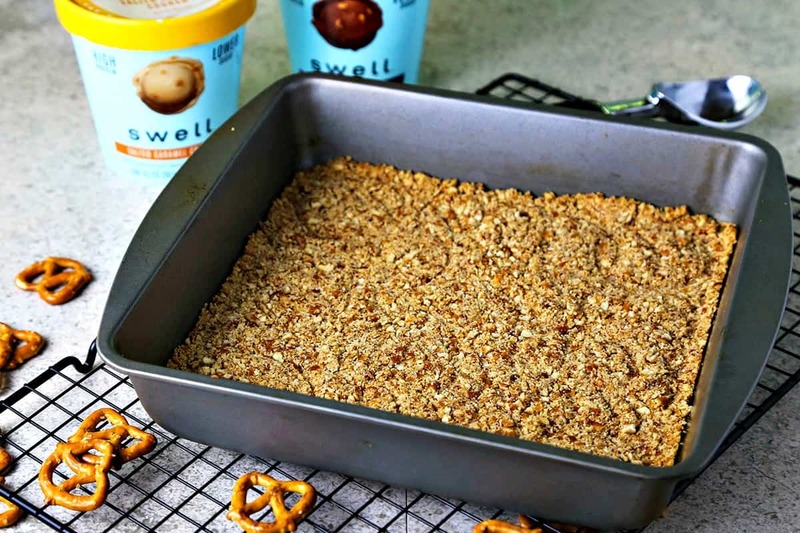 I am proud to be partnering with Swell, The Next Wave of Ice Cream to bring you this tasty recipe! As always, all opinions are 100% my own. Skip the cookies and opt instead for this better-for-you (and super delicious!) Dark Chocolate Salted Caramel Ice Cream Dessert made with Swell, The Next Wave of Ice Cream! On these hot July days, it’s extremely difficult to keep my ice cream cravings in check. Truth be told, I could eat ice cream every day of the week, but that’s not particularly good for my waistline! That’s why I was super excited to learn about Swell Ice Cream. Swell Ice Cream is delicious, extremely creamy high-protein ice cream. 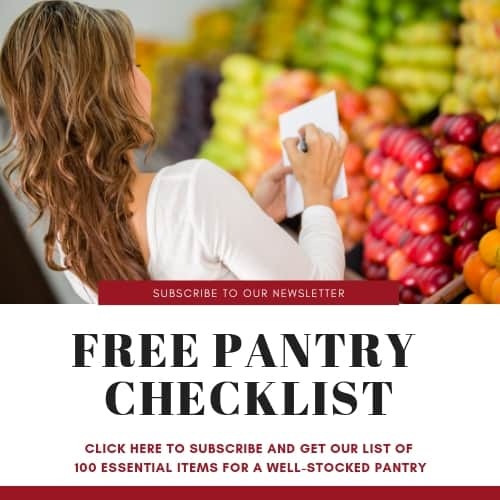 Each ½ cup serving is packed with 10 grams of protein—the most of any better-for-you ice cream—and has only 120 calories and is low-fat (2.5 grams or less). That means I can dig in without feeling guilty! 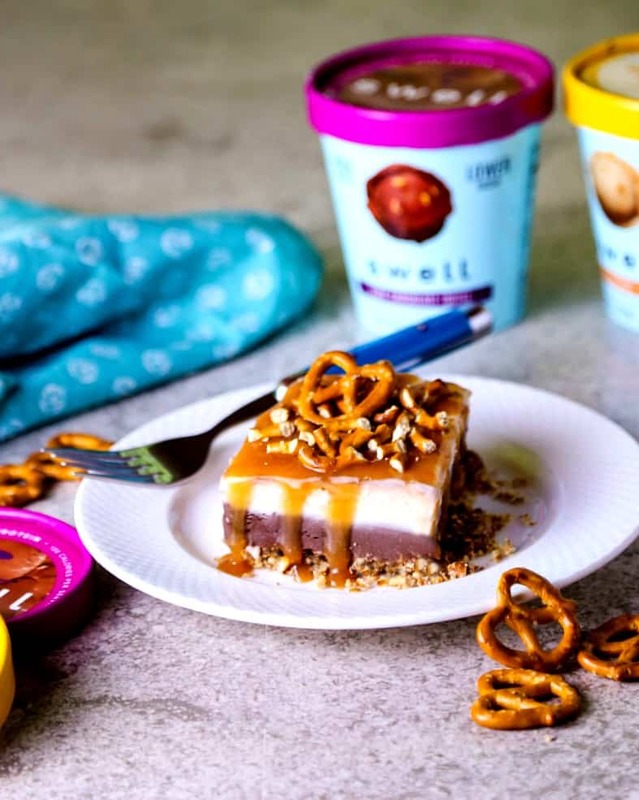 Swell ice Cream comes in a variety of awesome flavors like Dark Chocolate Toffee, Chocolate Chip Cookie Batter, Peanut Butter Chocolate Chip, Salted Caramel Crunch, and Cookies ‘N Cream. 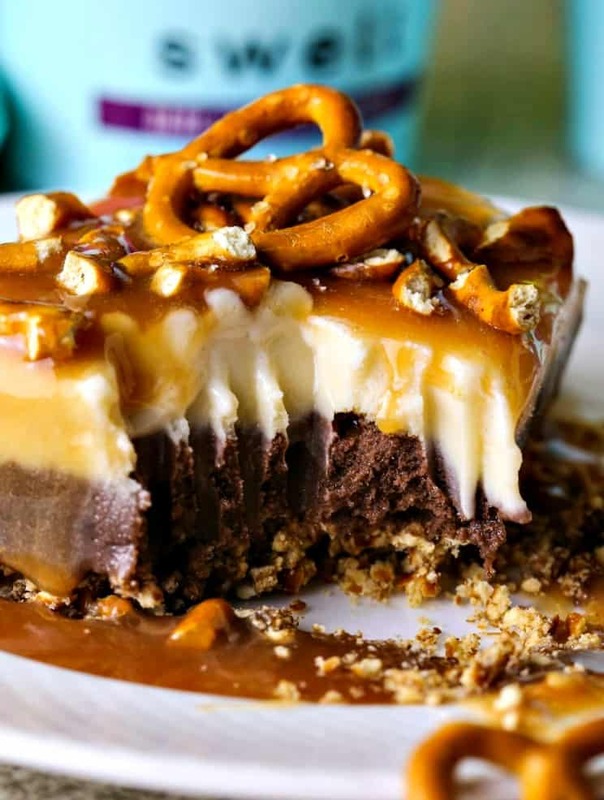 I have combined two of my favorite flavors in today’s decadent ice cream dessert recipe, Dark Chocolate Toffee and Salted Caramel Crunch, on top of a crispy pretzel crust. This dessert is sort of like an ice cream pie, only much easier to make. The first step is to prepare and bake the pretzel crust and allow it to cool completely. Put the first layer of softened ice cream on top of the cooled crust and smooth it out. Freeze uncovered for 30-45 minutes and then add the next layer of ice cream, smoothing it out evenly. This time, place a piece of freezer paper, shiny side down, on top of the ice cream layer and press it down gently. Pop the pan back into the freezer for at least two hours or overnight. How easy is that?! 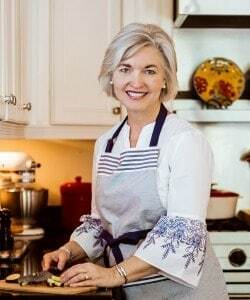 When you’re ready to serve, let the dessert sit at room temperature for about 10 minutes. Remove the freezer paper and cut into squares. 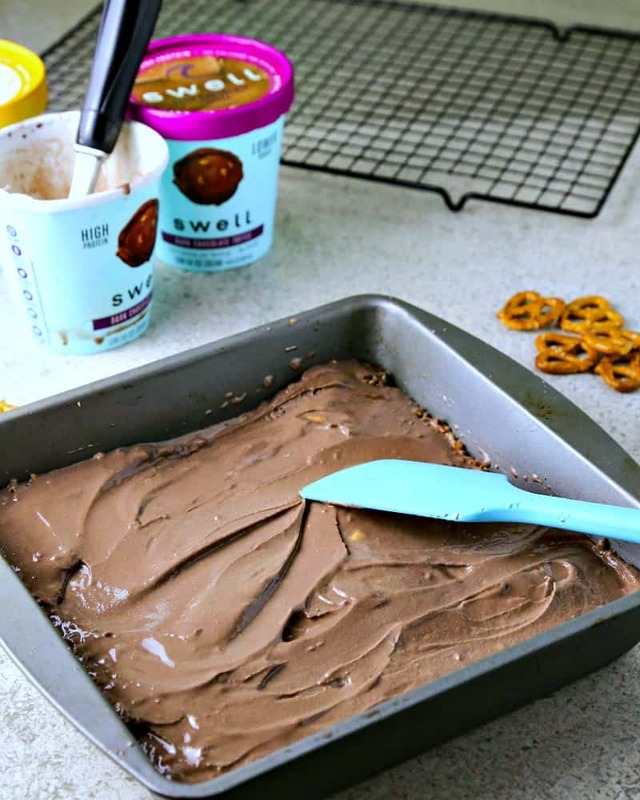 Top each square with a squeeze of caramel syrup and sprinkle with more crushed pretzels. 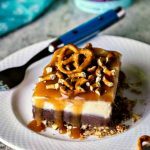 Sweet and salty, smooth and creamy with a little bit of crunch, this chocolate and caramel treat is spot on! Of course, you can enjoy Swell Ice Cream straight out of the pint, but it’s also perfect to add to a smoothie or breakfast bowl. 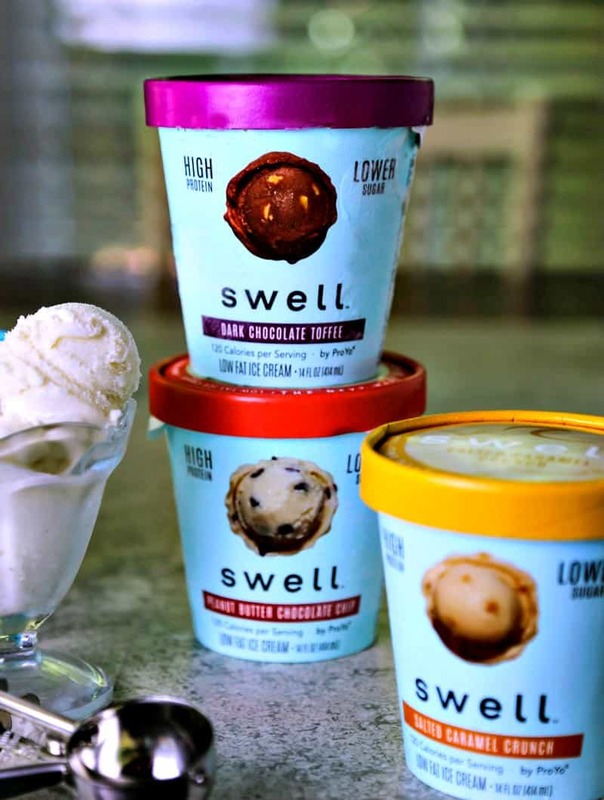 And as an added bonus, Swell Ice Creams are soy free, certified gluten-free by GFCO. Find Swell Ice Cream across the U.S. by checking out the Store Locator—I know I love picking up my favorite flavor of Dark Chocolate Toffee (no surprise there for this chocoholic!) at my local Kroger. Skip the cookies and opt instead for this better-for-you (and super delicious!) Dark Chocolate Salted Caramel Ice Cream Dessert! Preheat oven to 350 degrees. Add crust ingredients to a food processor and pulse 4 or 5 times until combined. Pour into a 9x9-inch baking pan and press crumbs evenly with a wooden spoon or bottom of a glass to form a crust. Bake for 10 minutes, or until golden. Remove from oven and cool completely on a wire rack. Remove Swell Dark Chocolate Toffee Low Fat Ice Cream from freezer and allow to soften for 10-15 minutes so that it can be easily spread. Drop small scoops of ice cream evenly over crust, then use a spatula to spread layer evenly. (NOTE: if ice cream is not soft enough, it will pull crust up from the bottom of the pan.) Place pan in freezer for 30-45 minutes to freeze. Remove Swell Salted Caramel Crunch Low-Fat Ice Cream from freezer and allow to soften for 10-15 minutes. Drop by small scoops on top of the chocolate layer and smooth out layer with a spatula. 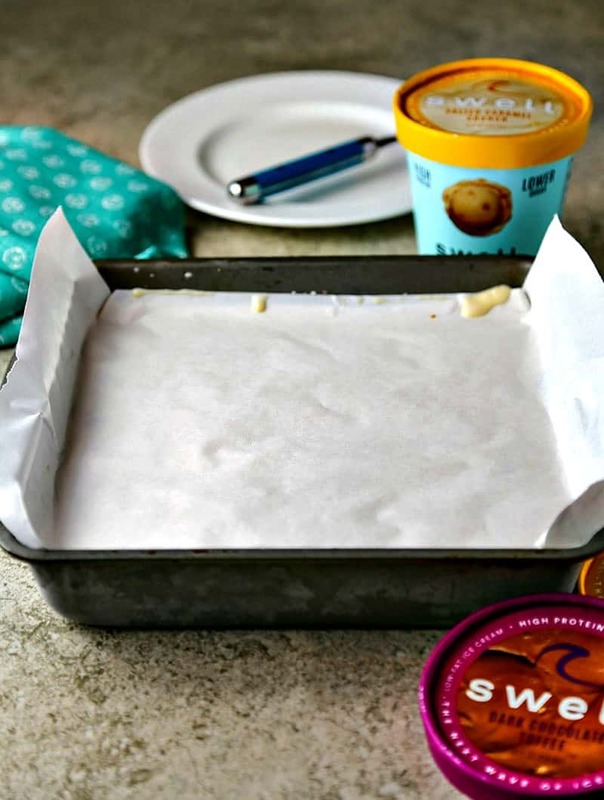 Place a piece of freezer paper (or wax paper) directly on top of ice cream and press down gently. Return to the freezer for 2 hours or overnight. Remove ice cream dessert from freezer and allow to sit at room temperature for 10 minutes. Cut into 12 pieces with a sharp knife or spatula. 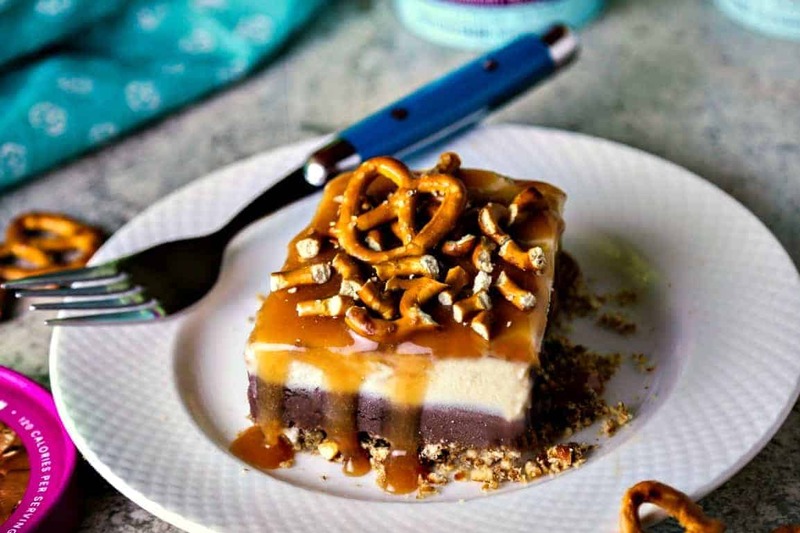 To serve, drizzle with caramel syrup and top with crushed pretzels.